Hammersmith and Fulham Council said it was left with “no choice” but to shut the bridge to motorists, until refurbishment costs can be met. 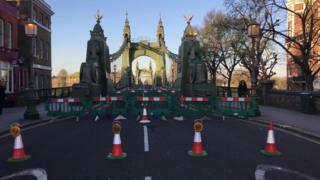 Government “budget cuts” left Transport for London unable to repair the 132-year-old bridge, the council said. The Ministry of Housing, Communities & Local Government has been approached for comment. Private vehicles and seven bus services have been banned from using the bridge. Pedestrians and cyclists will still be able to use the crossing from Barnes to Hammersmith. Hammersmith Bridge opened in 1887 and requires reinforcing to cope with heavy modern traffic like buses and lorries. The council had previously threatened to close the bridge after its strict rules allowing one bus to use the bridge at a time were broken. In a statement, the council said: “Our weekly safety checks have revealed critical faults and we have no choice but to shut the bridge. “Hammersmith Bridge is a Grade II listed, 132-year-old, structure. It was never designed for modern traffic.